Save As… has been renamed to Export in Lion’s Preview. I’ve verified that these instructions for using Preview to compress PDFs continue to work in Mac OS X Lion. One minor problem is that the last paragraph—that you can even “filter while printing” without using Preview is no longer true, but it wasn’t true in Snow Leopard either. I can’t remember if it worked in Leopard or if it last worked in Tiger. I took some screenshots but haven’t included them here; they really are exactly the same as when I wrote those instructions. The only real difference is that in Lion, “Save As…” has been renamed “Export…”. The main issue, as Vinnie pointed out in the comments is that after you create the filter it doesn’t automatically show up in Preview’s list of Quartz filters. Either ColorSync or Preview is working from the wrong folder. ColorSync saves your filters in your personal “Filters” folder under your “Library”. But Preview looks in “PDF Services” for the filters. Copy or move the new filter from your Library’s “Filters” folder to your Library’s “PDF Services” folder. If you want to make the filter available to everyone who uses your Mac, put it in the main “/Library/PDF Services” folder instead. Note that Lion has hidden the Library folder, so you’ll need to use the “Go” menu and “Go to folder…” to go to your “Library” folder, and also to go to the “/Library”, depending on whether you are making it available for yourself or for everyone. Further note that Preview in Lion, but not Snow Leopard, (sometimes? always?) has problems finding Quartz filters inside your own PDF Services folder, so you may have to always put it in the main Library’s PDF Services folder instead. Oddly, the Print dialog doesn’t have any problem with this, only Preview. This will work in Snow Leopard as well—and will sort of bring back the ability to use the filter directly while printing to PDF. 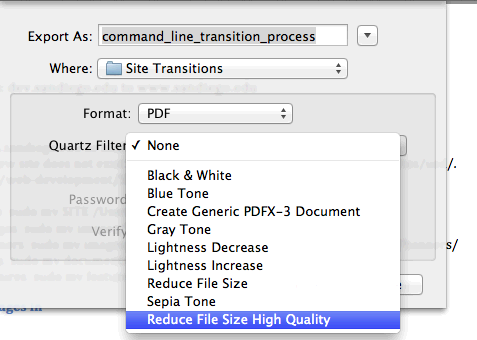 The filters will be available under the PDF menu; on choosing a Quartz filter, it will immediately save the current document as a PDF. The Mac doesn’t seem to ask for a filename, and just deposits it on the Desktop, though some of that may have to do with settings on my computer. In response to Quality reduced file size in Mac OS X Preview: You can use Quartz filters to reduce the size of your PDFs in Mac OS X while maintaining a high image quality. Calculating a true three-fold PDF requires determining exactly where the folds should occur. It is very easy to add links to PDF documents using reportlab or platypus in Python. You can use ReportLab’s Platypus to generate multi-column PDFs in Snakelets, Django, or any Python app. You got Mako in my Django! You got Django on my Mako! Two great templates that template great together. One of the things I need to do to move my current web site over to Django is be able to automatically generate PDF documents. Step is to learn how to generate PDF using Python. In Lion, if you MOVE (vs. copy) the filters, then you can't delete them from Colorsync Utility. Found out the hard way. I'd recommend copying them. I tried it and for me the new filter does not appear in the window Export under Quartz Filter.So what I had to do is open the ColorSync Utility and from there to apply the new filter. Any ideas why this might happen? If you’re using Lion, make sure you put it in the main /Library/PDF Services folder. If it doesn’t show up when you put the filter there, no, no idea why it isn’t showing. Hi. I can't seem to find a "Filters" folder in Lion. I have found both PDF Services folders. On the Lion computers I used for testing, the “Filters” folder was in the Library folder under your home directory (so that if your username is “Todd” on your computer, it would be in /Users/todd/Library/Filters). i can't find the filters folder either. not in users library or main library. Any ideas? Have you been able to find where ColorSync saves the files? If not, try using Spotlight to find them. Thank you for making this tutorial. I can't believe resizing a pdf involves all these steps! I am using snow leopard and these directions work for me perfectly. I am having one issue however- The new size is not consistent for each pdf I resize. I created a 3 page PDF that resized to 840 KB and another 2 page PDF that resized to 2.7 MB. Why the difference? I am resizing them using the same colorsync option that I created under your instructions. If the size is based upon the number of pages this isn't going to be a viable option for me. The PDF's I am resizing are Flyers that I have made for my company and they are all a different # of pages and all contain different content. Hey, jane. Sizes won’t be relative directly to the number of pages if they have images in them. The complexity of the images in a document will swamp any effect the number of pages has (except insofar as more pages means more opportunity for complex images). Most likely the difference between your 840kb PDF and your 2.7mb PDF is the number and/or complexity of the images. It could also be the dimensions of the images: sometimes if you put in camera originals rather than reduced-size versions, the size of the end document will explode. This is because the file size of an image is proportional to the square of the dimensions. That is, a 4,000 by 2,000 pixel image is sixteen times larger than a 1,000 by 500 pixel image. You don’t need to manually adjust the size of the image; use the Image Sampling option in ColorSync to set a maximum dimension (I think it’s a maximum height) and ColorSync will re-dimension the images for you when necessary. Over on the parent page, Dotty recommends a maximum of 1026 pixels, but you can play around with it to see what works best for you. Jade, sometimes you have to create Library folders the first time you put something in them. copy the new filter in there to "System/Library/Filters/"
Thanks. I have found a problem with saving PDF from docx files, it generate huge PDF that its size cannot be reduced with your filter (7 pages in 10Mb, all text). Saving all the content in doc format before saving it as PDF significantly reduce the file size to few hundred KB even without applying your filter. I have tried searching the internet for the cause of it to no avail. This worked for me for a single page but how do I alter a multi page pdf file size? When I tried, it just converted the front page of the document to a reduced file size. Jackie in UK, I have never seen that happen unless saving as a PNG or some other image. Are you sure you have it set to save as PDF? If you can't see the "Library" folder, click on the "Go" menu at the top. Towards the bottom of the menu, click on "Go To Folder..."
type in "library" and hit enter. The User/Library folder will appear! Thanks for the post and all the helpful comments. This is quite convoluted but it did the job! After the filter is created in Colorsync, open FINDER and pull down the GO menu. fleshed out a bit from Ken below - thanks Ken. Quality compressed PDFs in Mac OS X Lion last modified February 19th, 2012.